Print Cyber™ is a unique cyber security analyzer for networked print fleets. It inventories, reports and remediates device security settings to effect desired enterprise-wide cyber security controls in diverse multi-vendor networked imaging device print fleets. Print Cyber™ includes recommended best practices by device (known as Gold Standards) and stock comprehensive reporting (records) including inventory, security settings, and remediation efforts and many others. 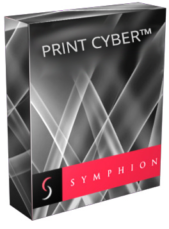 Symphion concierge teams use Print Cyber™ to deliver our turnkey Print Fleet Cyber Security as a Service™ solution to assist customers in establishing print fleet cyber security in diverse print fleets. Print Cyber™ is deployed on and utilizing Microsoft technologies and comes in both Professional and Light versions.